The upper roll of Four Roller Plate Bending Machine makes fixed rotation while the lower roll clamps plates and move vertically. The lateral rolls can change bending shapes by adjusting single roll or single group of rolls. Side rolls can be aslant or curvedly adjusted. It can bend the edges of plates, thus when rolling thin plates, it can avoid skidding sheets and also make the coarse plates become smooth. 1. Four Roller Plate Bending Machine is very suitable for the production of medium and heavy plates or stainless steel and can make ferrules of full circles or varying radii according to EC Safety Directives. 2. Equipped with welded steel frames and high-quality steel rolls, making the induction harden forged. 4. 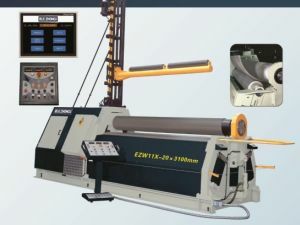 Four Roller Plate Bending Machine can provide unitary stress relief and overload protection with three digital readouts for an easy roll positioning and hydraulic drop-end for an easy removal for finished ferrules. YSD Company provides all kinds of metal forming equipment, including press brakes, guillotine shears, Four Roller Plate Bending Machine, pipe forming machines, laser cutting machines, tack welding machine, etc. As well-known Plate Bending Machine Manufacturer in China, YSD’s products are widely used in the field of heavy machinery, aerospace, shipbuilding, oil transportation pipe as well as construction pipe.